Clay is a great medium for students to get introduced to form. Most students can just pick up the clay and start making cool stuff. This lesson can be a little challenging for some students because it demands that the student have some understanding about the characteristics of clay. 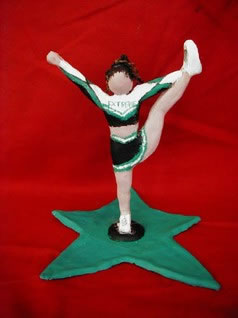 But making clay figures gives the students an opportunity to express themselves in a fun way. This lesson can really be adapted to Middle School students as well. I have had great success with this lesson in my intro level art classes. Overview and Purpose: To expose students to clay hand building techniques as well as to working in form. Students will also gain understanding in the differences between form and shape. Objectives: The student will learn the difference between shape and form and create a figure made of clay that can stand or exist on its on without added support. Delivery of info: Teacher will use the document camera to show a demonstration on the technique of scoring and slipping clay for attachment. Students should be fully aware of the proper techniques for connecting pieces of clay together. Guided Practice: Students will build their pieces in class while the teacher walks around and monitors progress. Be sure to have a good place to store the clay sculptures. A wet cabinet is best, although they are expensive to purchase. A nice alternative is a shelf. To keep the pieces moist so that they don't dry out too quickly, wrap them in plastic bags. Once the figures can stand on their own, you can take a sandwich bag and lay it on top, so that the piece is covered on the top but can began to dry slowly from the bottom. Be sure that students create a base for the clay figures to stand on. Encourage students to be creative with their clay base. It's also a good idea to have them build the base first, and then proceed to creating the clay figure itself.